Program evaluation helps organizations determine if the change that they set to accomplish actually occurred. Change can be knowledge gained, attitude change, or behavior change. For example, did a literacy tutoring program help the students who were not reading on grade level actually catch up to reading on grade level by the end of the program period? Or, are the low-income children who participated in a high-quality pre-K program ready for kindergarten? At Transform Consulting Group, we are data nerds and love helping organizations develop and implement evaluation plans to assess their change by using a four-step process. The first step is to ensure there are clear outcomes in place that support an organization or program’s goals. We work to develop SMART outcomes: specific, measurable, achievable, relevant, and timely. In this step, we typically review or develop a logic model, which is just a technical description of aligning your programs to the change (or outcomes) that you want to accomplish. For example, a college-readiness program may want to increase the number of students who can (1) identify a major or career they are interested in pursuing after high school; or (2) understand how to apply for college financial aid. The second step focuses on having the right data tools and systems in place to measure and report back on the designated outcomes. Transform Consulting Group helps organizations determine the most appropriate tool(s) to collect, track, and monitor accomplishment of the identified outcomes. We consider organizational capacity (staff time, knowledge, and budget) when suggesting data tools. Some examples could include participant surveys, assessments, and student academic records. We work to have data tools that are valid and reliable and will provide the data necessary to monitor progress. The third step is to analyze the data once it has been collected, and present the results in an easily-understood format. Data is measured to determine whether program outcomes were met and the change, if any, that occurred. This is often the step where organizations get stuck, because they don’t have the staff time or knowledge to complete the analysis. [Stay tuned for a separate post on simple ways to analyze your data!] We tell our clients that this is the fun part because we can see if what they set out to accomplish actually occurred! Are program participants being reached as intended? If yes, why? If not, we also want to know why. To what extent are desired program changes occurring? Was there a significant difference or just a small difference? Is there a specific group that is not being impacted? Is the program worth the resources it costs? What is the “return on investment” for this program or service? 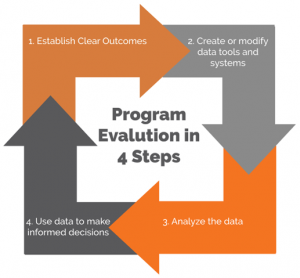 The fourth step is to discuss the results of the program evaluation and make informed decisions based on what the data tells us. 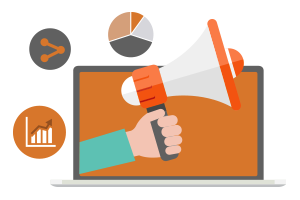 We will compile a summary report and/or slide deck presentation of the evaluation data for stakeholders internally and externally to review the results and discuss the implications. Good evaluations often lead to recommendations for improvement such as enhanced professional development, diversified participant recruitment strategies, and/or program model changes. This is an opportunity to discuss data collected and implications for future programming, including ongoing program evaluation practices within the organization. In today’s era of accountability, what gets measured gets done. If you don’t measure results, you can’t tell success from failure. Transform Consulting Group equips organizations to celebrate their successes and inform opportunities for growth. Contact us today for more information on how Transform Consulting Group can help assess the impact of your organization. Reinventing Government, Osborne and Gaebler, 1992.